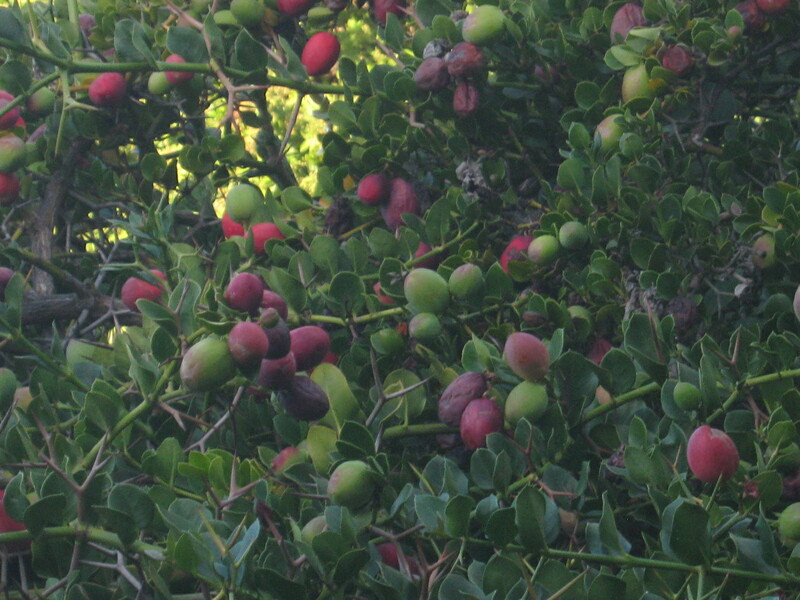 Carissa macrocarpa or Numnum are indigenous to the eastern regions of South Africa and grow very well in Cape Town with its Mediterranean climate. Having been around here as food for quite a while they have indigenous names, like Amatungulu in isiZulu. The name Noemnoem in Afrikaans does not appear to come from the Bantu languages, perhaps it is Khoesan in origin, and it does look like a typical double syllable compound noun, which abound in the Namagowab lexicon. 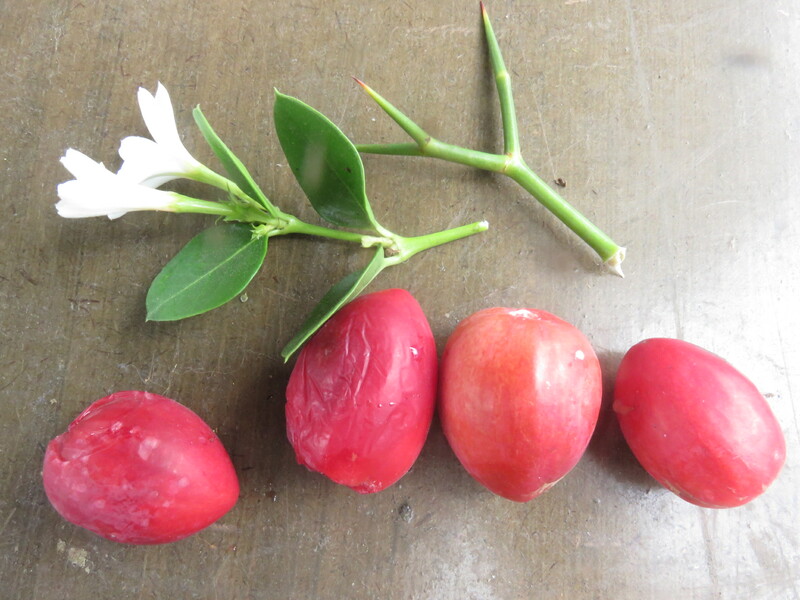 The Numnum forms small trees with horrible, burning Y shaped thorns (hence the alternative name Carissa bispinosa), glossy green leaves, white jasmine like flowers that smell of magnolia, and delicious red fruit that have a very high vitamin C, magnesium and phosphorus content. I find the fruit has a versatile range of culinary uses such as brine pickles, natural vinegar and jams. 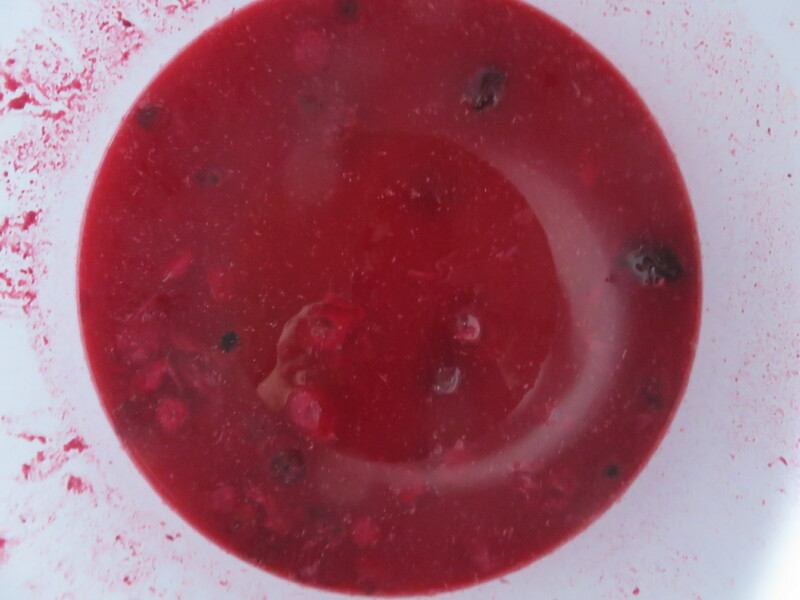 The deep red colour of the berries is persistent and colours all these products attractively, producing deep pink vinegar for example, with a fresh fruitiness that lasts and ages well. The fruit exudes white milk which sets the teeth on edge a little, and must be high in tanins. Perhaps the combination of acidity and tannins is the reason for Numnum vinegar lasting better than some others. They blend very well with milk products. The most delicious tarts I've ever had combined two glazed Numnums in a pastry shell topped with whipped cream, and fresh Carissa macrocarpa are fabulous with vanilla ice cream, better than strawberries and cream. The Numnum ripens and goes brown and oversoft or bad really fast. It is hard to get them at the perfect stage of ripeness. If I'm making jam I pick them every day and ripen them in a basket in the sun. 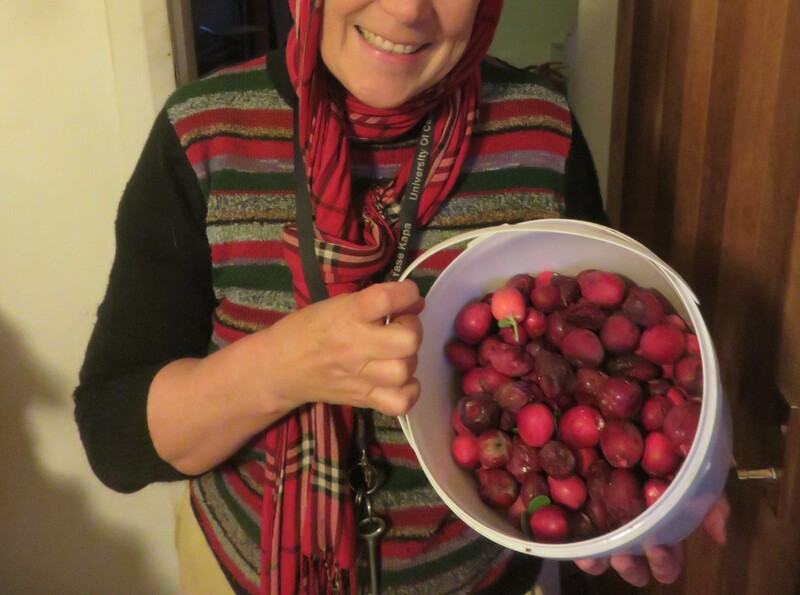 I pick out the fruit in the basket every day which have the right colour and softness and freeze them immediately. When I have a few kilograms of fruit in the freezer I make the jam. The freezing does not make them mushy and they still make really chewy jam because they have very high natural pectin. Before freezing the fruit remove the pips. 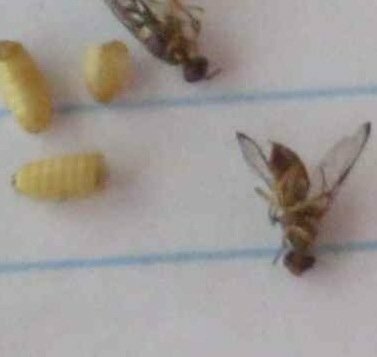 They are the most bitter things and will spoil the flavour of jams when you bite on them. It must be something in the cooking process because for some reason they do not taste so bad in the fresh state. 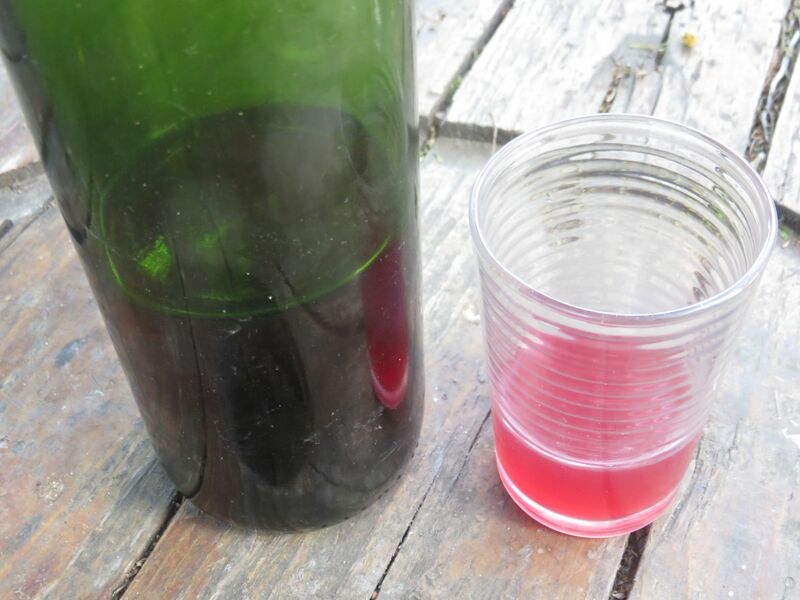 The freezing also does not matter if you are making wine or vinegar, but you will need to add sugar to get the ferment going. Picking the fruit is pretty tortuous. To get past the stinging thorns I've tried using braai (barbecue) tongs, which are probably the most effective way of harvesting. I also tried a long 40mm PVC tube with a lasso in it for ripping off the fruit at a safe distance. The fruit are supposed to roll down the tube into a basket, but it just produced mush. There is no way round it but to be careful. Commercial growers prune the bushes for more comfortable harvesting. Pruning improves bearing, and keeping them as narrow hedges makes access to the fruit and avoiding the thorns easiest. This makes sense as in my experience the fruit are usually borne in the sunshine, on the top or sunny side of the plant. I have a tree about four meters tall which constantly bears fruit, and the more you pick the more it bears. However, the tree is twenty years old, and has been bearing so profusely for about ten years, so they are slow to mature. The other three trees of a similar age are one meter tall and have produced a handful of fruit in all this time. They can bear fruit within 2 years after taking cuttings. 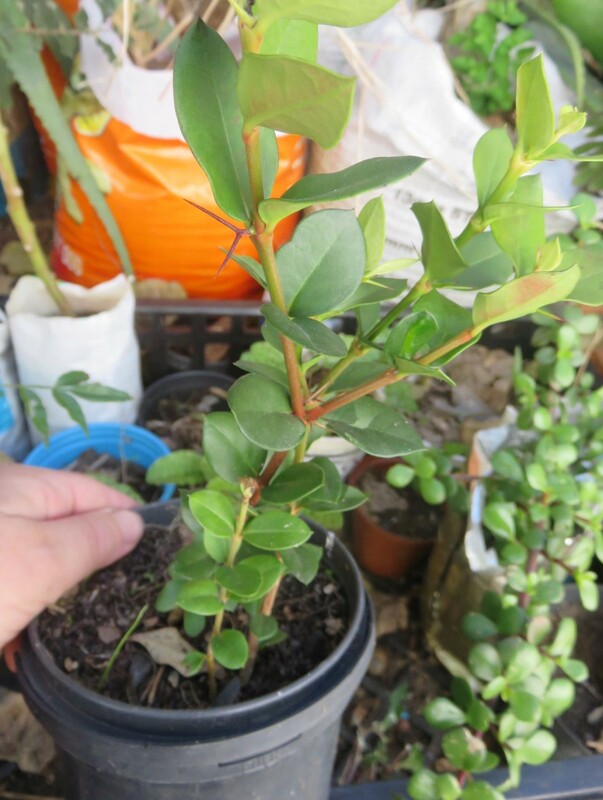 Although the literature claims Carissa macrocarpa is fast growing, I found them very slow to reach any decent height, one reaching a height of about 3-4 meters after ten years, and the others not exceeding 2 meters after twenty years. In my experience they can grow partially as an under story, but with too much shade it is unlikely to fruit well. Carissa could be planted at the edge of another tree's shade, and form part of a tiered food forest on the sunnier side of larger trees. 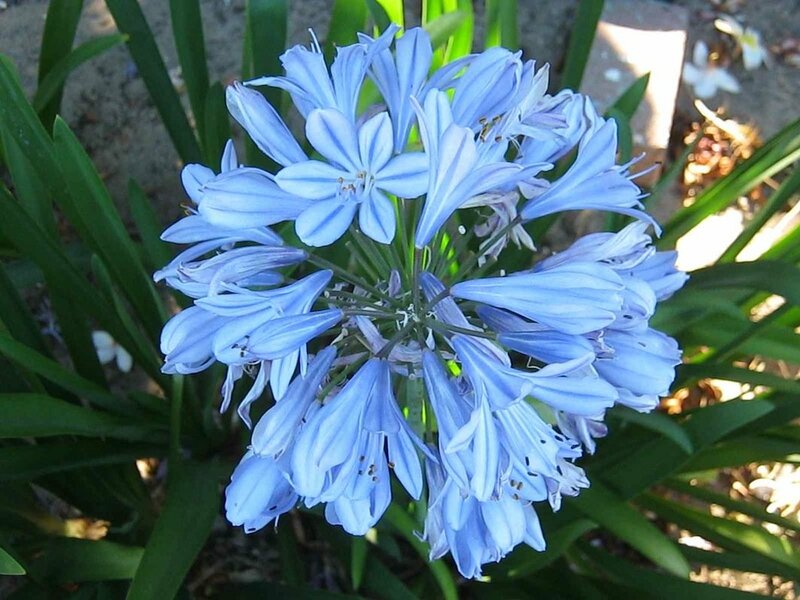 It is most frequently planted as a hedge plant in South Africa, giving security with its thorns. After twenty years you may find it grows fast enough to require constant pruning and the thorns are bothersome in areas like narrow driveways or along the street where they come into contact with pedestrians. It makes a thickly entwined canopy. The thorns hold the branches together so that the are hard to disentangle. It is evergreen and the leaves do not all fall when they day, leaving the underside of the thorny canopy with a bit of dead brown foliage. The fruit dry on the tree, becoming blackened and shriveled. Falling debris from the dried fruit and thorns caused a trip to the emergency room for a very painful eye injury, so please wear goggles when pruning, and thick leather gloves used for working with barbed wire too. Apparently Carissa tolerates salt laden wind, but is frost tender. Its flowers are bisexual, so that you only need one plant. 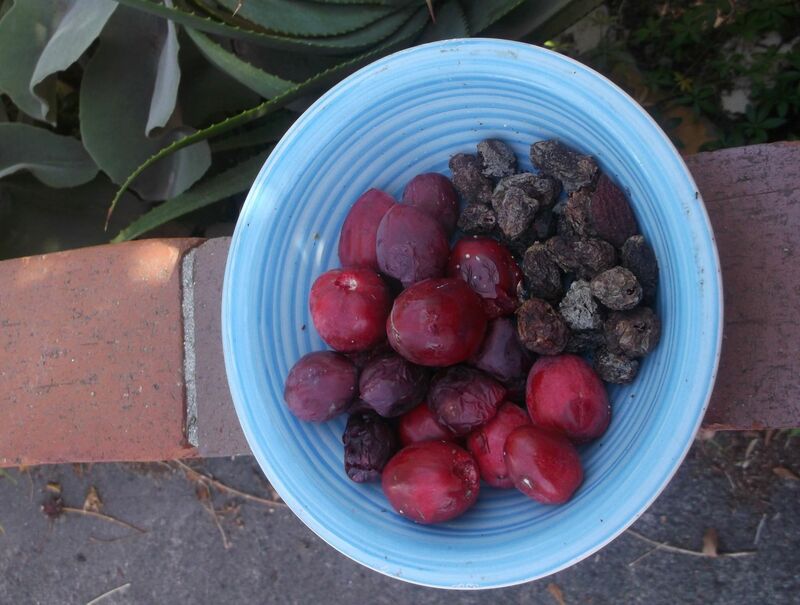 In California several selected varieties have been developed for larger fruit with fewer seeds. For these varieties and some tips for commercial propagation you can look at the link to Wikipedia, and for more growing information you can use the superb official South African indigenous plant database PlantZAfrica.com. 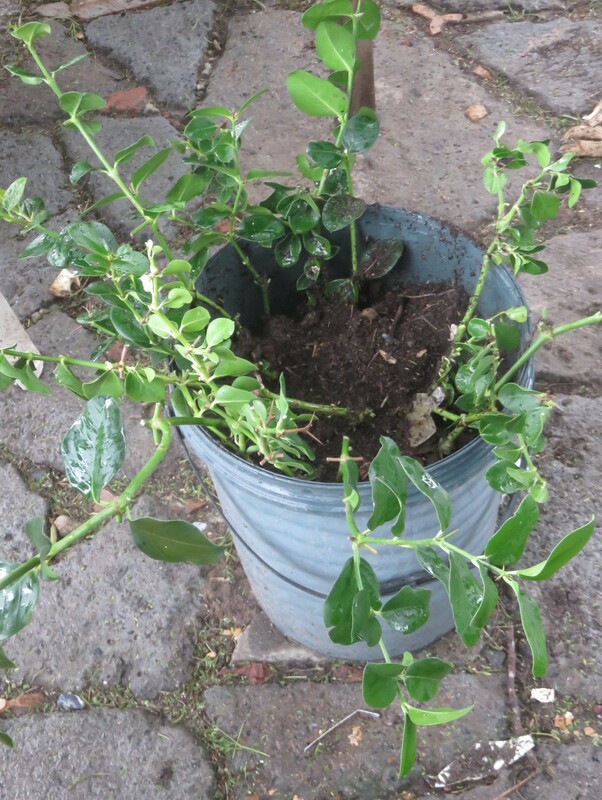 I bought some of my Carissa macrocarpa trees and grew the rest from cuttings decades ago. I took about twenty cuttings. These were small 15cm twigs from which I removed most of the leaves except for about 4, and kept under plastic till they rooted, in a bottle terrarium. To make a bottle terrarium cut the top off a plastic two liter water bottle, make a hole in the base, fill half full with soil to give the leaves room, and finally replace the top. 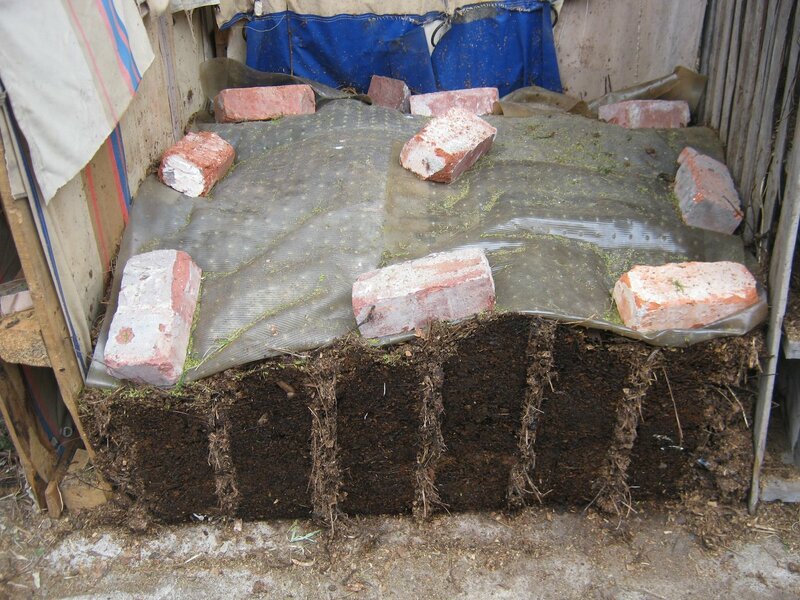 This creates a small greenhouse with high humidity which helps cuttings not to dry out. Do not place it in direct sunlight in very sunny climates or they will steam cook. I managed to raise three cuttings. 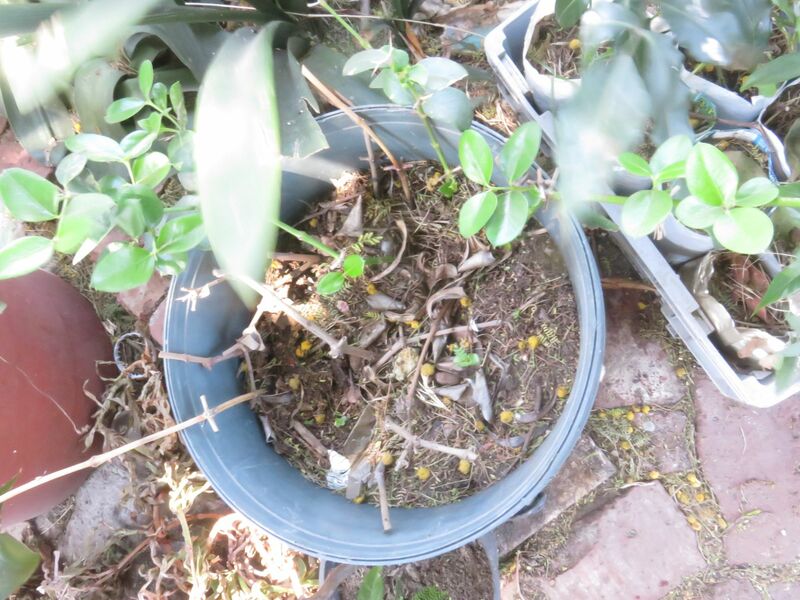 Roughly a year ago I stuck 12 branches about 50cm in length with about 8-10mm thick stems in a bucket of sand without any protection from the elements but the shade of a large tree. During preparation I brushed a little root hormone on the stems and took off all but six of the leaves on each cutting. I watered them every second day, without fail, and three of the cuttings have taken, so that is about 25% success in our climate. It is likely that larger cuttings have a higher success rate. 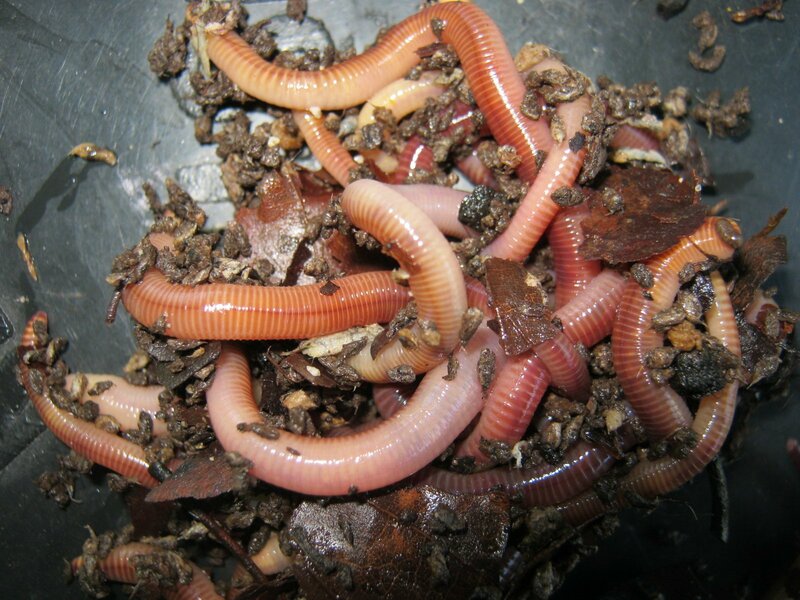 Recently, a Numnum seedling has emerged from the compost in which kilos of Numnum fruit and seed pulp containing thousands of seeds was fermented two years ago. According to Wikipedia, the seeds germinate within 2-4 weeks of sowing, although growth of the seedlings is very slow at first. This may be why I had the impression that the seed must have taken several months to germinate. For a very long time it would have been a small seedling that was indistinguishable from local weeds with glossy cotyledons. The seeds are small, about the size of tomato seeds, so I would expect them to germinate in this kind of four week time frame. We see that numnums can be grown from seed but cuttings are probably a lot easier.